One of the challenges of teaching in a high school or middle school that uses block scheduling is many students struggle to focus for 80 minute, 90 minute, or longer blocks of time. I always try to break up blocks like this into shorter segments with breaks. To prevent breaks from running too long, I always use a timer. I also use timers to time break-out activities. Whenever it is possible to do so, I like to display the timer countdown on a projector or whiteboard so that all of the students can see it. These are the three timer tools that recommend more than any others. Task Timer is a free Chrome app that you can use to time multiple tasks or events at the same time. The app works online and or offline in the Chrome web browser. After installing the app you can create a set of tasks that you want to time. You can run multiple timers at once or run them individually. The timer functions on a countdown basis. A chime sounds when time has expired on each timer. Russel Tarr's Classtools Countdown Timer has two slick features. You can create and set multiple timers on the same page. 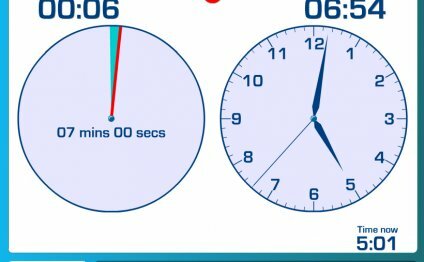 This means that if you had students sharing in rapid succession you wouldn't have to reset the timer for each student, you simply move onto using the next timer on the page. The second feature of note in the Classtools Countdown Timer is the option to add music to your timers. You can have your countdown timers set to music. Mission Impossible, The Apprentice, and Countdown are the standard music options. You can add other music by using the YouTube search tool built into the timer. A third timer option is to simply type into Google search "set timer" followed by an amount of time and a countdown timer is displayed. An alarm beeps when time is up. You can make the timer appear full screen without advertisements by clicking a little box icon to the right of the timer. You can see this feature in action in the video below. This is a list of the novels in The Baby-sitters Club, a children's book series created by Ann M. Martin. Titles are followed by either the date of the first printing (month and year) or by the copyright date (just the year).